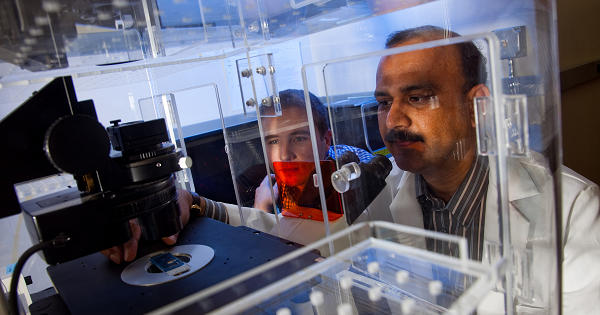 Pictured above: Dermatology professor Nihal Ahmad, PhD, and his research group look at the biology of melanoma and are identifying more features that can be targeted specifically with drugs. Melanoma medical oncologist Mark Albertini, MD, thinks we are in a “true age of enlightenment” when it comes to treating the skin cancer, especially with immunotherapy-based treatments. Not content to stop at 50 percent, Albertini and other melanoma researchers at the UW Carbone Cancer Center are studying ways to improve response and survival rates even more. Albertini’s research group takes the immunotherapy approach to studying melanoma. Immunotherapies have been incredibly successful in some patients, but other patients have shown no response. His group has already developed a way to take blood and biopsy samples from patients with advanced-stage melanoma and to isolate immune cells that were activated by the patient’s natural immune response to the cancer. Now, in work funded by a UW Carbone pilot grant and melanoma philanthropy group Ann’s Hope, Albertini is taking these activated immune cells and using them to look for markers that will help him and other clinicians predict who is going to respond to immunotherapy. He is working in collaboration with UW Carbone medical imaging researchers Robert Jeraj, PhD, and Steve Cho, MD. Dermatology professor Nihal Ahmad, PhD, and his research group look at the biology of melanoma and are identifying more features that can be targeted specifically with drugs. Previously, his lab showed that a pro-cancer protein, PLK-1, was present in higher levels in cancerous melanomas compared to the non-cancerous melanocyte skin cells. In both cell culture and mouse models, they showed found that reducing PLK-1 levels led to death of the cancerous, but not non-cancerous, cells. Perhaps most promising, the PLK-1-targeting drug is already in clinical trials for other cancers. Much of Albertini and Ahmad’s previous lab research has informed the development of melanoma clinical trials at UW Carbone and elsewhere. They still direct their current research with the same goal of being translated to the clinic, increasing survival rates and decreasing the need for non-specific – and less effective – chemotherapies.